My Message Wall is temporarily closed. Please feel free to contact a different administrator for any inquiries. Recently Roblox made a new sponsored event. Yes sponsored. And it's probably the last one. I need your help to make a page about it. I already told to Anzu your father but incase he isnt online I will tell you bout it. Anyway if he already made it I guess you will just help expand it? I doubt it's the "last sponsored event". Roblox said monthly events (this would mean events such as "Pizza Party" or "Powers"). Roblox will continue doing sponsored events and annual events (Egg Hunts and Hallow's Eve, maybe Roblox Universe as well). Oh I thought they meant by monthly events and sponsored events. Well... That's disappointing the fact that sponsored is still up but as long as they gave a lot of items it doesn't matter..? How did you disable your message wall before? For the username, spaces should be underscores (_). If I decide to create a page in this wiki about the ROBLOX game Ro-Ghoul and its creator SushiWalrus, may I do so? 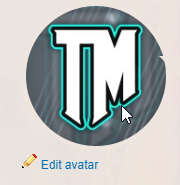 On your profile, mouse over your current icon and an "Edit avatar" option should appear.